Cincinnati Pride is pleased to announce two Grand Marshals for the Cincinnati Pride Parade 2017. 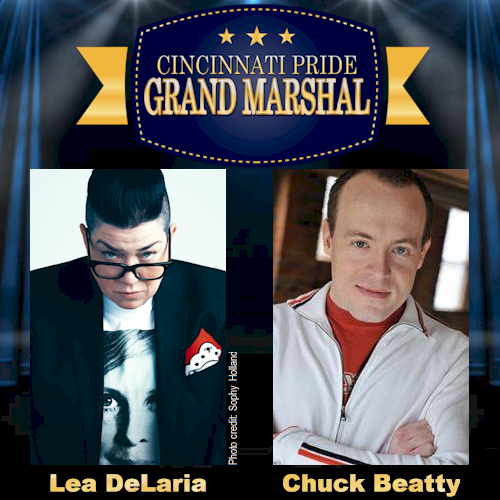 Our celebrity Grand Marshal will be comedian, actress and musician Lea DeLaria. Our community leader Grand Marshal, as selected by the Cincinnati Pride Board from the many submissions we received, is Chuck Beatty. Lea has five records on the Warner Jazz and Classics label and her book "Lea's Book of Rules for the World" is in its third printing at Bantam Doubleday and Dell. Chuck Beatty has worked for 6 years as the Festival Director and founder of the CNKY Film Festival, which later took on the name “OutReels Cincinnati”, the film festival started by The Gay and Lesbian Center of Cincinnati. Chuck is a member of the Imperial Sovereign Queen City Court of the Buckeye Empire (ISQCCBE) and a committee member for Northern Kentucky Pride. He served as editor for two former local LGBTQ lifestyle magazines: CNKY Magazine and Unite Cincinnati. Chuck has a reputation as a tireless supporter of the LGBTQ community in the Greater Cincinnati area and has produced several cabaret fundraisers for local charities including Caracole.